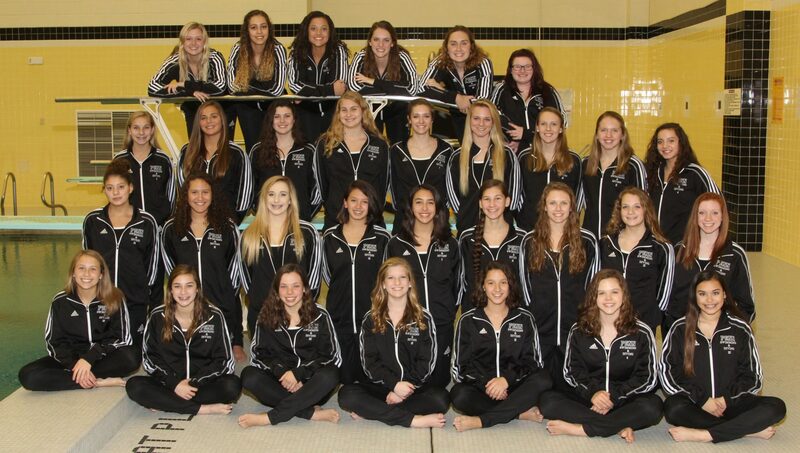 Led by four first-place finishes each by senior Meagan Ronci and sophomore Maddie Ziegert, Penn rolled up 616 points to claim its 23rd consecutive Northern Indiana Conference title on Saturday, Jan. 14, at the Penn High School pool. This streak is credited to all past and current swimmers, as well as Penn’s long time head coach, Jess Preston. But this particular was won without the presence of Coach Preston, who was unable to attend due to illness. Assistant coaches Josh Lercel and Aimee Costa filled in and helped lead the Lady Kingsmen to the victory on Saturday. 200 medley relay: 1. Penn (Maddie Ziegert, Kionna Clayton, Makenna Bottorff, Meagan Ronci) 1:46.28 (meet record; old record: Penn, 1:47.26, 2014; pool record; old record: Penn, 1:47.53, 2012). 200 freestyle: 1. Kayla Molnar (P) 1:55.83. 50 freestyle: 1. Maddie Ziegert (P) :24.08 (meet record; old record: Madison Blakesley, Riley, :24.38, 2016). 100 freestyle: 1. Meagan Ronci (P) :53.1. 500 freestyle: 1. Kayla Molnar (P) 5:08.97. 200 freestyle relay: 1. Penn (Meagan Ronci, Maddie Ziegert, Sydney Acito, Makenna Bottorff) 1:38.16. 100 backstroke: 1. Maddie Ziegert (P) :58.24. 100 breaststroke: 1. Kionna Clayton (P) 1:05.2. 400 freestyle relay: 1. Penn (Meagan Ronci, Makenna Bottorff, Kionna Clayton, Kayla Molnar) 3:34.99 (meet record; old record: Penn, 3:35.16, 2013.